Is that fear you are feeling, dear reader? Yes... Rampage feeds on terror. Let it grow! But can I let Rampage into the Soldiers of Valhalla? Rampage is basically just a tiny Frost Giant. They share similar stats, both have Indomitable, and both can potentially get multiple attacks per turn, with Rampage’s power generally being the better option in that regard. Warforged Resolve and an extra life are at least equal the Giant's 2 extra defense in most cases. This is disconcerting considering that leaves the Frost Giant only Dying Swipe and a few minor benefits and synergies to make up for a 20 difference in price. There's nothing wrong with Rampage's theme, but he doesn’t feel particularly necessary either. Warforged can be barbarians just like they can be pretty much any class in D&D. That's pretty much it though, there's nothing terribly iconic or unique about a Warforged barbarian. The powers are a good fit for a barbarian, but I don't think Rampage is a very good fit with Vydar's particular troupe of Warforged. Vydar's Warforged all have a slight theme of giving you tactical options in combat. The Soldiers dictate positioning, Heirloom can move treasure glyphs around and has a 'smart' explosion attack, and Siege can switch modes depending on his needs at the time. Rampage takes most of the decisions out of your control. He can get extra attacks in, but only if he is rolling well. He can gain extra move or attack, but your opponent can influence that about as much as you can in some cases. He feels like the black sheep of the Vydar Warforged to me. Rampage has two reused powers and one rather unique new power. However, that new power still plays close enough to the Frost Giant's Battle Frenzy that Rampage feels like a retread of old ground. That's not necessarily a bad thing, there are quite a few official units like that, but it's not a point in his favor either. As expected, he basically plays like the Frost Giant. Unfortunately, the few differences there are just make him feel like a superior option. Destructive Rage is almost always better against squads than Battle Frenzy, as is Warforged Resolve and 2 defense compared to the Giant's 4 defense. This means Rampage can charge right into the front-lines against all but the deadliest squaddies and still earn his points, not something the Giant can normally do. The Giant fares slightly better against heroes since he can still get in multiple attacks, but in most cases 6 attack is plenty dangerous to Heroes on it's own that it's not all that much of an advantage. The Giant also has a few immunities due to his size, and does get the advantage of Ornak's Red Flag of Fury (though he has a lot of competition from better Utgar Heroes there), but none of his synergies or immunities are that significant in most cases. Dying Swipe is the one trick Rampage can't do better than Frosty, but it doesn't justify a 20 point difference by itself. There are a few select situations were the Giant might be a better pick than Rampage, but in general Rampage is by far the scarier option for most armies to face. Overall, Rampage feels like a slightly better Frost Giant for less points, and doesn't seem like a necessary addition to the game. While I like the general direction of the unit, I don''t feel he is SoV material just yet. I vote to induct the Rampage to the SoV. Rampage has received to Nay votes to induct and has been removed from the process. FWIW, Paizo lets you add 53 of them to the cart. Anyone know if that's an accurate reflection of their inventory. But good gosh, $8 each? My assumption is that whenever they don't cap out at 99, that's probably an accurate number. We're up against a monster twenty miles long and two miles wide... forty square miles of agonizing death. You can't stop it, but will anything stop the Red Ants from joining the Soldiers of Valhalla? The Ants are an exact match for the Blade Gruts in stats and points, and both are 'swarm' units, which gives a good starting point for comparison. Their power sets are quite different however. The Ants have a strictly better version of Wait then Fire, but it is vastly less devastating when the unit lacks range. Horde attack and their Soldier synergies are nice, but nothing overpowering. Overall, they seem a good fit at 40 points, especially considering you will need to draft a fairly large amount of them to get their full potential. Overall, I feel the Ants really capture the theme of an overwhelming swarm. An individual ant is weak, and they go down easy, but eventually they can win a war of attrition through sheer numbers. Some may have a problem with them being soldiers, but I don't share that concern. If Fyorlag Spiders can be scouts, I see no reason why the Ants can't be soldiers; especially given the picture their new bio paints. Relentless is a great personality for them, it fits the overall feel of their power-set very well. All of the Ants powers are effectively reuses. Crushing Mandibles only being a slight change of Wait Then Fire to better synergise with Horde Attack and be more useful on a melee squad. A melee 'Wait Then Fire' squad is rather unique all on its own though, and the powers create a unique play style when taken as a whole. 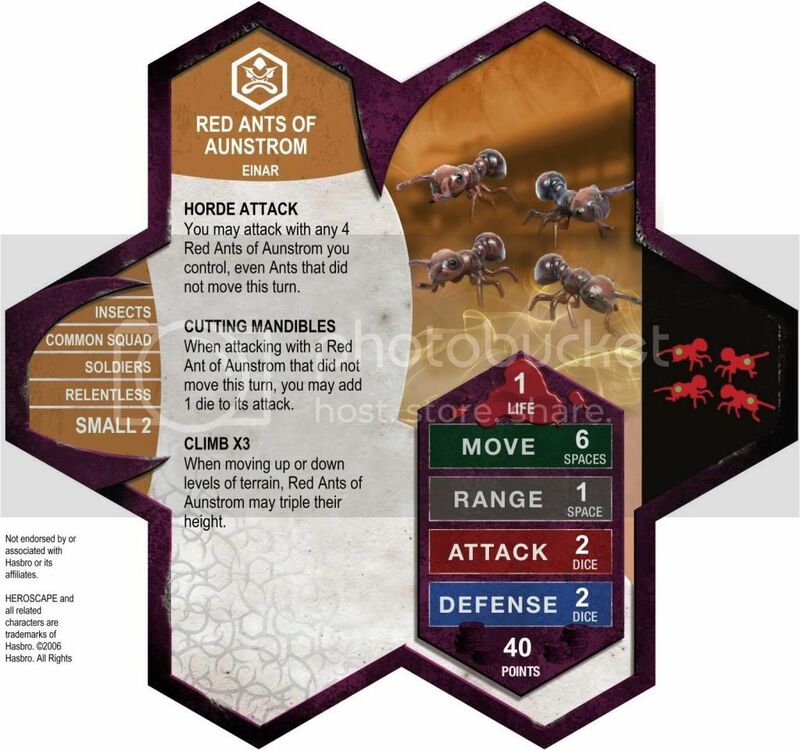 The Red Ants can definitely be a bit tricky to play, with only 2 defense and no defensive special abilities to speak of, they will take causalities quite fast, and they're no better at getting troops to the front-lines than any other squad until they can make use of horde attack. Eventually they will be able to keep some Ants engaged with the enemy, especially against an army that can't get 4 or more attacks per turn, and once that happens things can start to shift in their favor. Moving up 4 fresh Ants while getting Crushing Mandible backed attacks by their comrades is pretty potent. The key is for them to not take unrecoverable losses before they reach board stability. The Ants can do quite well in Heat of Battle, were it is much easier for them to get into engagements fast enough to make use of their powers, but I didn't find them overpowered. There aren't really any other special formats where they play substantially differently. The move bonus from Marcus can be helpful for the Ants, but his attack enhancement (and Khosumet's) is typically not worth trying to pull off. Raelin can also work well with the Ants, more survivability makes it much easier for them to reach the level of board control they need to thrive. The Ants also have some potential as an 'offensive screen' for ranged units. I generally found that if I activated the Ants, I wanted to keep full Oms on them to keep up the pressure. However, if enough moved up with Horde Attack they can often clog up the field to the point where the can function as a semi-screen after it stops being efficient to use them directly. Overall, I found the Ants to be a fun unit that captures their theme quite well. They're well balanced and add something different to the game. I vote to induct the Red Ants of Aunstrom to the SoV. If there's something I've always felt Heroscape didn't have enough of, it's non-humanoid creatures. A giant purple worm? I'm game! Given that and the fact that Ashi-Dhulu is slightly cheaper than Grimnak, at first blush he appears to outclass his predecessor. However, Grimnak has vastly better synergies, not the least of which is his own Orc Warrior Enhancement. Orcs thrive on synergy. Also, an instant-kill ability is even more potent when used with bonding, as it can help clear the way through screens. Increased movement and offense vs. orc synergies? Hard to judge how they compare with just theoryscaping. Beyond the Grimnak comparison, 115 seems to be a reasonable guess for the unit's value. I love the addition of a giant purple worm, the figure looks fantastic, and the powers are both very thematic. I even like the name (though not everyone does, and that's understandable). The anagram is neat, and my inner geek loves the Dune reference. It also feels vaguely Lovecraftian to me, like Ashi-Dhulu is an offspring of Shudde M'ell or something. Underground movement and a devour ability are pretty much expected for a giant worm. Those concepts are well developed here in a way that is easy to understand and play. Let me just say: Ashi-Dhulu is definitely Menacing to any opponent with Common figures. There's just no stopping it -- the Worm eats what it wants to eat when it wants to eat it. My initial impression is that he was crazy strong, and he can certainly seem that way to low-attack swarm units like Blade Gruts. Then I changed my playstyle to be smarter and specifically play against Ashi-Dhulu, and my opinion changed. That's the real fun of this unit: playing against the Purple Menace you have to take its abilities into account and play around them. It's nigh impossible to avoid Devour, but it isn't too difficult to avoid allowing him follow up Devour with an attack. That's something you should prevent unless you're confident in your unit's defensive abilities. Losing one Common a turn is annoying, especially for higher-cost Commons, but it is not unreasonable. Units with lower attack dice may have trouble getting a hit through, but that's nothing new. Keep spread out and keep swinging. Against Uniques Ashi-Dhulu isn't very good. Stealth Underground Movement is awesome and lets him attack pretty much whatever he wants to, but you usually want more teeth on something you dump 115 points into. With no great synergies, he's just a single attack of 4 every order marker. Not terrible, but there are better ways to spend your points. Sadly, this means he's not very frightening as a baddie in a dungeon crawl. A bummer perhaps, but not a huge loss. Overall, the Purple One is useful in a variety of different ways in an army. You can play it as a threat, hovering around the battlefield occasionally devouring a figure, causing your opponent to play sub-optimally. Or it can work like a shark, devouring both enemy units and your order markers until it dies. 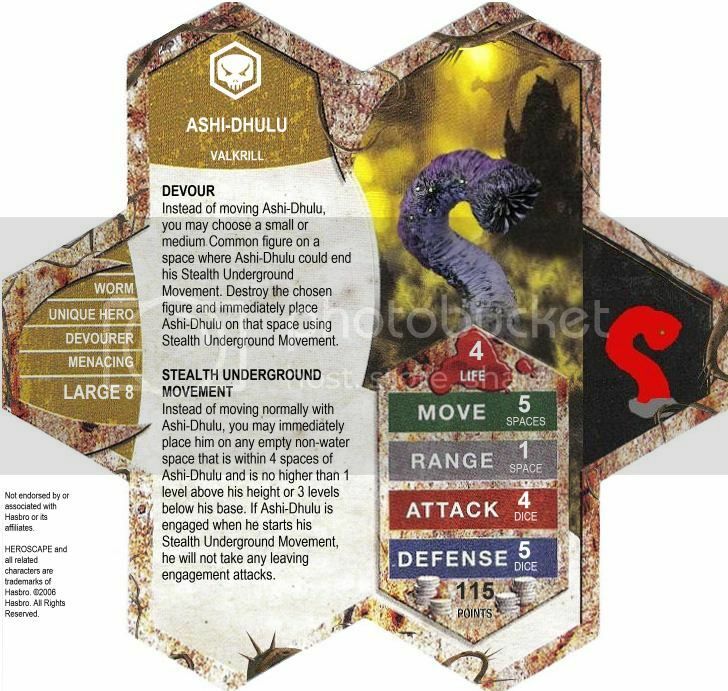 Ashi-Dhulu can even play the role of an assassin in a pinch, thanks to Stealth Underground Movement. Is 115 points too low? Too high? I think I would have been a tad more comfortable at 120 points, but I honestly don't think it is as good as the 120 point powerhouses like Krug, the Fen Hydra, and Kaemon Awa. The Worm is worth more than 110 points though, so 115 is a good fit. Ashi-Dhulu outclasses Grimnak as a solo hero, but Grimnak isn't used as a solo hero often anyway--his real power comes from synergies. I love the theme and concept and it is well-executed here. Ashi-Dhulu provides a unique play experience, both playing with and against. I vote to induct Ashi-Dhulu into the SoV. Last edited by Scytale; July 9th, 2014 at 07:39 PM. Is 115 points too low? Too high? I think I would have been a tad more comfortable at 120 points, but I honestly don't think it is as good as the 120 point powerhouses like Krug, the Fen Hydra, and Kaemon Awa. The Worm worth more than 110 points though, so 115 is a good fit. Ashi-Dhulu outclasses Grimnak as a solo hero, but Grimnak isn't used as a solo hero often anyway--his real power comes from synergies. That's exactly why I priced him at 115, as well as to get him to a different point total than others. Thank you for the vote. as well to the Warden. Thanks for the info, Ixe! Balance - Knights of Aundair are an intriguing two man squad that takes a new approach to bonding. Coming in at 40, they are on the high range of cost per figure of 20 compared to bonding units like Knights of Weston(17.5), Romans/Sacred Band(12.5), and Deathchasers(18.33). They are like a double-bladed sword. In close combat with their heroes, they are deadly, but separated and alone, they fall quickly. Once their heroes are dead, they become a vanilla 3 man 3/3 squad for 60. Playability - Both powers are slight changes to current powers in the game. They are straightforward and read easily. The minis are the same size, go well together. and blend in nicely along side other heroscape figures. Creativity - They are very unique in the sense that they are a two man bonding squad whose available heroes currently do not see much gameplay. The choice is delicate; do you move and attack with a hero or instead use a third squad member? Theme - Knights always have a place in Valhalla. 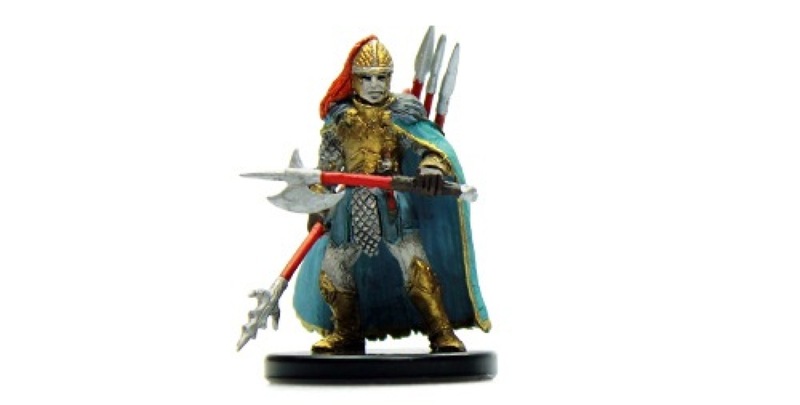 General Background - Knights of Aundair hail from Eberron. A predominate human nation. Knights Aundair generally translate to something like Knights of the Realm. My inspiration for this unit came from the Movie King Arthur(Clive Owen) and the interaction and inspiration that King Aurthur had on his knights. Choice for picking Aquilla over Jandar, Aquilla has more units from Eberron and they have the look and feel of Rhogar. Aundair has a history of Dragonrider and Dragonknights, thematically they tie in nicely. It was a hard choice, but in the end they "Feel" more Aquilla than Jandar. Like I said elsewhere, I'd lean more toward Jandar, but official 'Scape went against my expectations from time to time, so I'm ok with Aquilla. It's a solid attempt at making a viable 2-man squad. I also appreciate the research into Eberron. I like how the design is put together. The bonding is a neat way to dodge the issues of a 2-man melee squad, and they look like they'd be fun to play with their bonding options (Sir Dupuis and Rhogar Dragonspine). That said, the miniatures bother me. The Dragonrider doesn't come cheap, nor does it look entirely human. Due to dissimilar weaponry and color scheme, when side-by-side, do they look like they belong to the same squad? Within reason, visual similarity should be considered important to Common Squads. The Miniatures can be found for around 3-4$ for the first figure and for the dragon legion I purchased him for $3.99 at Coolstuffinc. Some places have him listed higher, some lower. If your local gaming stores are anything like mine then they will have singles also available to purchase. ~$8 a squad is I think within reason. Here is a link to a good picture of the Dragon Rider. I think he looks human enough. When I get a chance I will setup the ones I have and take some battle scenes so you can get a better feel. As for Knights, many throughout history did not look that much alike in armor. Suits of armor were custom made, tailored like a fine suit and very expensive. The idea of the Knights of Weston running around all looking super similar is not the norm. Every knight used different weapons of choice depending on what they were trained for. Just in the recent C3V release, the Shield Smiths, and Knights Blackgaard all had different armors, and weaponry. I think the color schemes are close enough that one can tell they are apart of the same squad , close enough as squads like Tarn Viking Warriors. I hope this helps answer your concerns, and thank you for your consideration.